The first trimester of pregnancy encompasses roughly the first 12 weeks. Gaining weight is a normal part of pregnancy, but not every woman gains weight in the first trimester. Typically, it is safe to lose weight during your first trimester, but you should not be actively dieting or trying to shed pounds. According to Parents.com, around 80 percent of pregnant women experience pregnancy nausea, which may make it difficult to keep down food. Food aversions are another reason for first-trimester weight loss, reports FitPregnancy.com. Parents.com advises that unless you have significant weight loss, such as 10 percent or more of your total body weight, first-trimester weight loss usually poses no health risk to you or your baby. Zeni Koutsi, a research midwife writing for the BabyCentre website, stresses the importance of not dieting during pregnancy. Some diets could leave you short of essential nutrients, like iron or folate. You also need to eat frequent meals to avoid drops in blood sugar. To avoid weight loss in the first trimester, FitPregnancy.com suggests eating up to six small meals per day and choosing healthy options, such as fruits, whole grains, vegetables and lean meats. Parents.com: Is It Normal to Lose Weight During My First Trimester? BabyCentre: Is It Safe to Diet While I'm Pregnant? 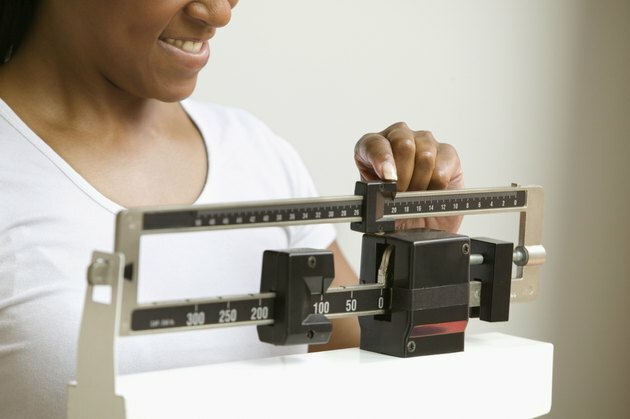 Can Exercising & Not Eating Make You Lose Weight?